It seems that CES 2019 is starting to bear fruit immediately, as the world record memory frequency has just fallen into the hands of the Toppc overclocker, beating the group of ADATA XPG overclockers by a considerable margin, counting the limits they have. The current modules. One step has been placed in the first place of 3 different categories thanks to the new Kingston HyperX modules. 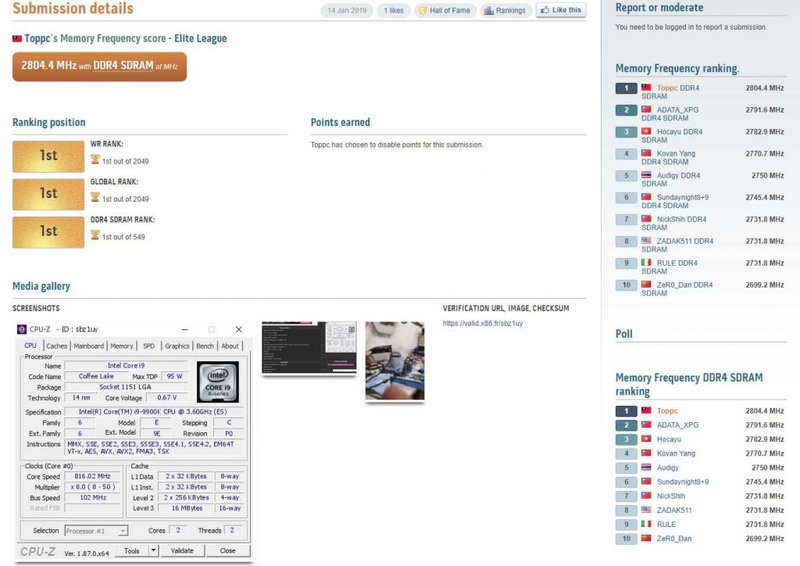 The truth is that the Topcc overclocker was just placed in the first position in 3 different aspects with this new world record: 1 position in WR, 1 world position in the category and first position in the range of SDRAM DDR4, all of a single time. To achieve the record, he had to establish some unusual parameters in terms of frequencies and hardware, since he had to collect an i9-9900K to which he had to lower the frequency to 816 MHz and where he has also had to enable only 2 cores in total of the 16 threads it is capable of handling. The voltage is another aspect to consider, since it has had to use undervolt to the physical limit of the processor, and that is that we speak of only 0.67 volts in total. Another interesting detail is the fact of raising the BCLK up to 102 MHz, modifying the frequency of the RAM and with it the divisor to a ratio of 1:55, where undoubtedly the IMC was more comfortable. 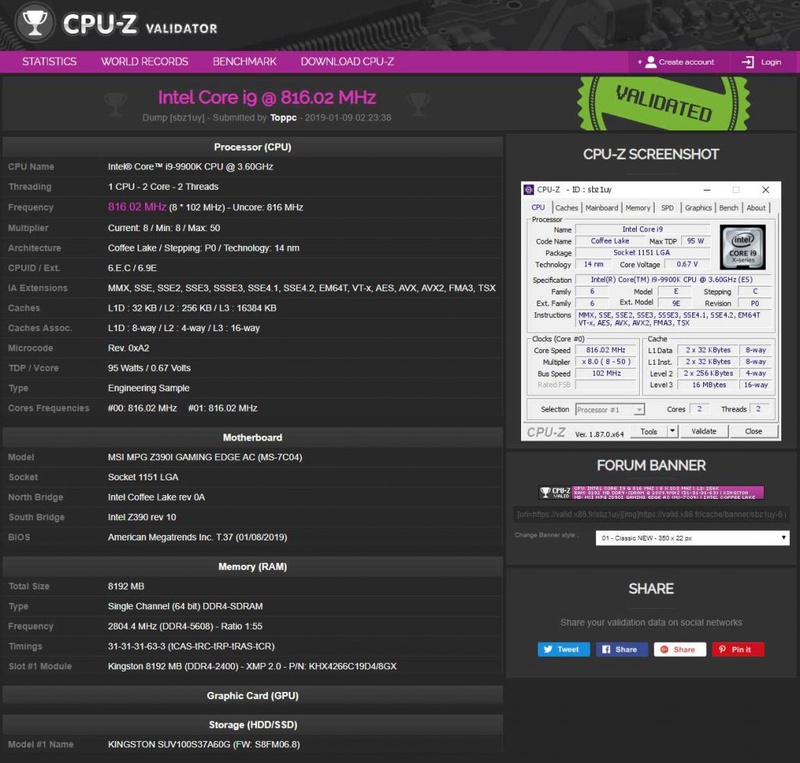 The chosen motherboard has been an amazing MSI MPG Z390I Gaming Edge AC with a new BIOS released on January 8 of this 2019. This is surprising because MSI so far was not emerging in extreme overclocksand less in achieving world records, where until now the Asus Maximus XI Gene was taking the cake while waiting for the new APEX. Along with this new milestone for the brand, we have to present the protagonists, since until now the only thing that is known is the model, revealed on the other hand by the same Toppc and of which there is no record or records. These modules are a Kingston HyperX DDR4 RAM BUS KHX4266C19D4 / 8GX, which means that these modules start with a speed of 4266 MHz and Cas19 latencies. The frequency at which the record has been broken is 2804 MHz (DDR4-5608) as we said with a divider of 1:55 with the peculiarity that only a single module of 8 GB has been used to achieve this figure. Latencies have been a spectacular 31-31-31-63-3, where you have to stress of course your tCR, which shows that the limit has had to go Toppc to beat that record. We do not know how long the crown will last, as many manufacturers are launching new modules with the new Samsung chips, in addition, the queen of the overclock has not been officially shown yet, so we’ll have to wait and see what it can do. In any case this should be a morale booster for the children of Kingston (with HyperX between) and MSI, since not every day one of your products get beat a world record where other companies like Asus or G. Skill cannibalize the top positions in the rankings.